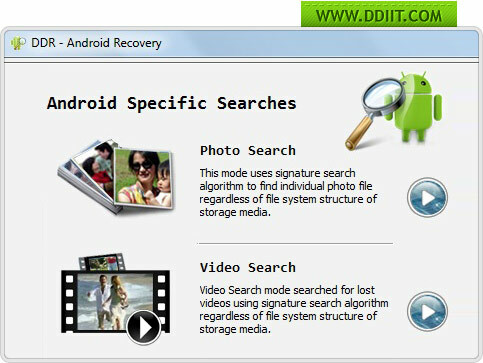 Android files retrieval program is designed and developed with innovative search recovery modes (Deep search, Basic search, photo search, video search, signature search) for finding and recovering all lost android files. Android recovery software gives you an opportunity to get back your all types of lost files from various kinds of android technology based devices like Android tablet PC, Android Smart phones and other android technology based devices. Android data restoration program easy to operate and provides user-friendly GUI. Android device provides different features as you can store infinite numbers of applications which is just wonderful. But people face data loss issues from android devices due to several reasons like accidental deletion, virus or worm attacks, mistakenly formatted android device memory card, human errors and other data loss situations. We provide solution for all your data loss problems. But there is also a restricted condition the device should not be used to store new data. Why? Deleted files can be overwritten by the new files. Once they are overwritten it’s impossible to recover them. Android data recovery software is non-destructive program that quickly retrieves all lost files and folders from Android tablet PC, Android smart phones and other android technology based devices. With the help of android files retrieval program you can restore photos, videos, images, wallpapers , documents, archives and other precious data from android device just in few easy steps.